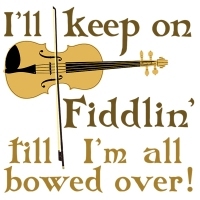 “I’ll Keep on Fiddlin’ till I’m all Bowed Over!” proclaims this corny countrified fiddle design. You can get it on t-shirts, apparel, mugs and ceramic items, mousepads and other products. Buy one now for your favorite fiddler – or get it for yourself!